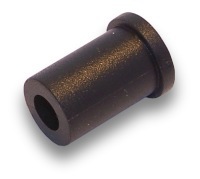 These D-Sub Hood grommets are designed to fit in the wire entry opening of D-Sub plastic hoods. They can be used to provide a cleaner, more finished look to a cable assembly. Various inner diameters are available depending on the size and number of wires that will enter the hood.